John McCain..Now for the rest of the story. John McCain. And now for the rest of the story. After John McCain’s death, I made a decision, because the man had just passed away I was not going to get involved in publishing some of the truths many people, perhaps most people do not know about the man. But after the nasty and vicious insolences displayed at McCain’s funerals, those callous attitudes changed my mind. Laudatory comments and speeches made to the departed at their funerals are expected, but the offensive and disgusting comments made by John McCain’s family toward those John McCain had publicly despised during his last years were unwarranted. In the last years of his life John McCain became a bitter and petty old man who put revenge against President Trump ahead of his duty to his party and his country. I am heartily tired of hearing how wonderful Senator McCain’s life was and how much this country owns him. After all of the insults made at his funerals toward those John McCain had detested, as opposed to the almost continuous broadcasts making McCain out to be the second coming, I just can’t let that happen without a response. 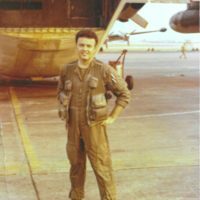 I am not going into John McCain’s naval career, except to mention he flew combat missions in South East Asia. Anyone flying combat in SEA never knew if they were going to have as many landings as take offs. I honor McCain and everyone who risked their lives in service for our country in that war, and I am not going any further into that. What the American public needs to know is more about his career as a Senator. Let’s start with my opinion, the State of Arizona has had two of the worst Republican Senators in our Senate for several years; Republican Senators who actively opposed the man elected by the people of this country to be our president. Senators John McCain and Jeffery Flake have marked themselves as men who think they are more important than their party or the people of this country who elected President Trump by opposing almost everything the president seeks to accomplish. Who will ever forget Senator McCain waltzing into the Senate, late for the critical vote to resend President Obama’s calamitous health care bill, then giving his thumbs down on the Republican parties attempt to throw out the disastrous Obama Care package? Every Republican Senator had told their constituents for years if they had control of the Senate, Obama Care would be gone, and it would have except John McCain thought more about his hatred for the president than his duty to his country and his constituents. However this piece will be about Senator John McCain not Senator Jeffery Flake; Flake deserves a piece all on his own, if anything Flake’s one term Senatorial performance is about as bad as a Republican Senators could ever be. Senator Flake has chickened out when he found out his approval rating in Arizona was 18% and decided to retire rather than face a primary run. He was wise to do so his approval rating in Arizona is now in the single digits; but back to John McCain. 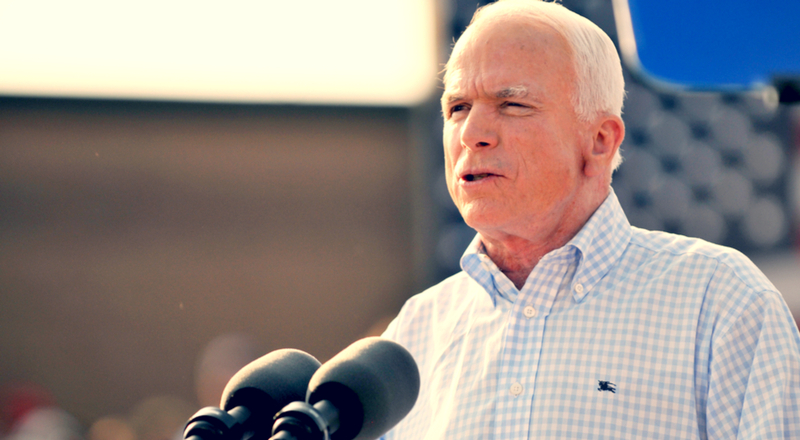 After his separation from the Navy, John McCain became a politician; he was elected Senator for the State of Arizona. About 30 years ago McCain decided he just might become president of the United States. However about that time McCain got caught up in the “Keating Five Scandal.” The scandal had to do with the savings and loan legislation problems in the 1980’s. Charles Keating was one of the largest, if not the largest Arizona home builder/developer at that time. Keating contributed quite a bit of money to the political campaigns of McCain and four other politicians. I guess Keating thought it was always a good idea to have some powerful friends in D.C.
A newspaper reporter in Phoenix, Tom Fitzpatrick, wrote an expose about the Keating Five Scandal. His headline was “McCain was the most reprehensible of the Keating Five.” He continued, “Keating thought McCain might make it to the White House. Keating poured $112,000 into McCain’s political campaign. Keating even made a sweet shopping center deal with McCain’s wife.” There was much more to that expose, but that will give an idea of Fitzpatrick’s intent. That money was determined to be illegal campaign contributions; didn’t work out too well for the Senator. After McCain got smacked around on that scandal he decided that just maybe if he stopped being a “Maverick,” which at that time he wanted to be known as, and instead if he became “Bipartisan” he could bring over some Democrats to his side in order to gain additional support for his presidential yearnings. McCain then put some of his bipartisan contemplations into effect and got in bed with one of the most far left Democrats in the Senate, Russ Feingold. In 2002 they both constructed the “The Bipartisan Campaign Reform Act.” The fact that they were warned it appeared close to being unconstitutional either didn’t bother McCain much or maybe he didn’t understand the bill himself. Perhaps he needed to show the world he had contrition of his past financial campaign shenanigans. As expected in 2007 the Supreme Court pretty much torn the Act up and most of the Feingold/McCain effort was shown to be unconstitutional. Once again McCain puts some of his bipartisan contemplations into force and got cozy with another far left Democrat. That would be Teddy Kennedy. They put in place a political immigration cockup in 2005. “The Secure America and Orderly Immigration Act.” As one might expect with left wing Democrat Teddy Kennedy involved, it was all carrot and no stick. Pretty much, hey welcome in all you illegals. Of course the Democrats loved it. The country hated it and the bill was rejected. Once more McCain craved to appear bipartisan by buddying up with far left Democrat, Teddy Kennedy that fat boozy philander. Why would McCain be involved in such a bill? Perhaps McCain believed with a Kennedy, it would make him look important and presidential, that must have sounded good to him, even though, if passed that bill would have wound up hurting his party and damaging his country. Now comes 2006 and here we go again. John McCain and Teddy Kennedy, that terrible duo, once more come up with an awful immigration bill; although it was sponsored by Harry Reid, the Senate Majority leader (who could forget that loser), the bill was primarily put together by McCain and Kennedy; “The 2006 Comprehensive Enforcement and Immigration Reform Act.” That bill, if passed would have resulted in huge amnesty for illegals and little border security, another vast wave of illegal immigration from Mexico. Again McCain puts his name on the line with a deeply flawed bill, but this time it could have cost him his job, what was he thinking, maybe just about himself? The country once more rejected another rotten immigration bill he had put forward with a left wing Democrat. However at that time the State of Arizona was full of radio and T.V. commentators verbally flaying the hide off McCain for doing so. The border State of Arizona had had it with open borders and amnesty bills by McCain. If the Arizona Republican Party could have walked and chewed gum at the same time and had chosen a solid conservative to run against McCain that year, l believe McCain might have lost the primary. They didn’t and McCain was returned to the Senate. In 2013 McCain once again goes into full tilt, overall personal failure mode with another immigration mess, “The Comprehensive Immigration Reform Act.” In 2013 the Senate is controlled by Obama and the Democrats. Of course this abysmal bill, which clearly indicated “it would clear the way for millions of undocumented residents to have a chance for citizenship and attract workers from all over the world,” should have shown this country then, what we now know, the Democrats don’t want secure borders, they want open borders. An outfit called the “Gang of Eight” led the charge to ensure that defective act passed in the Senate. The leader on the Republican side was John McCain. Their thinking was that in the 2012 election, Hispanics had voted 71% for Obama and only 27% for Romney and they had to do something to change that, or at least that was what the media told us. What these geniuses evidently never took into account was that the Hispanic vote was only 7 % of the total vote in 2012. Of course the Democrats really didn’t care about those statistics; it is now evident what their open borders religion is, get as many illegals into our country as possible so that at some time they can control another huge section of dependent voters. However what these wonders never took into account was, Romney received 78% of the evangelical vote and Obama received 21% of that vote. Guess what, the evangelical vote was not 7% of the total vote, but 27% of the total vote. Unless I’m mistaken the evangelical vote is almost 4 times larger than the Hispanic vote. Believe it evangelical’s would want a wall much more than open borders. Why did the Republicans on that “Gang of Eight” not cater to the larger vote? Maybe the Republican leader, McCain, had another agenda in mind. Oh by the way, President Trump received 81% of the evangelical vote in 2016. In January 2014, after the Gang of Eight fiasco, Senator McCain was censured in a whopping 1,150 vs 351 vote by Maricopa County Republicans (the largest county in Arizona). The resolution read in part ”only in times of great crisis or betrayal is it necessary to publicly censure our leaders. Today we are faced with both. For far too long we have waited hoping Senator McCain would return to our Party’s values on his own. That has not happened.” Can’t blame Trump on that one John. Arizonans cannot forget in 2010 John McCain ran a campaign ad where he swore “To build the danged border fence.” Senator McCain not only failed to deliver on that promise, he had proudly tried to insure the passage of the “Gang of Eight” immigration bill that would have allowed massive illegal immigration and granted de-facto amnesty to millions more illegal aliens. And still our Senate with leaders, such as the late John McCain, year after year, decade after decade will not pass legislation to insure a secure border. Two years into President Trump’s presidency, in September 2018, Mitch McConnell, the Republican Senate Majority Leader, once again refuses to fund the president’s secure border wall demands. When will this madness end? Open borders, which for all practical purposes, is what we now have are not what a “Sovereign Nation” requires. Just to insure that everyone knows who “The Gang of Eight” consisted of; the elder statesman for the Republicans was John McCain, for the Democrats, Chuck Schumer. I think they should have been called the “Politically Left Gang of Eight.” What the hell were McCain and those other Republicans doing supporting this open borders amnesty bill? What our country wants is not a Comprehensive Immigration Reform Act, but a Comprehensive Border Security Reform Act. Why does the D.C. swamp refuse to make that happen? For God’s sake, it should be a no brainer that any Republican who agrees with almost any Senatorial legislation which has the enthusiastic support of Democrats like Schumer and Durbin has lost touch with the principals that should govern their political lives. But we saw photos of John McCain laughing it up, arm in arm with Senator Schumer and Senator Durbin, congratulating each other and celebrating their terrible amnesty bill’s passage in the Senate. Thank God the American people came out and had voted to insure a Republican House of Representatives 2012. Their lousy open borders, amnesty first, Senate act was defeated in the House. Republican voters had better come out once more in 2018 if they want America to continue to succeed. The 2012 House election was the first act of defiance by the American people that would later insure a Republican House, Senate and a Republican president. It also insured that an historical statement would be made, Barrack Obama’s presidency cost the Democrat Party the House of Representatives, the Senate, the Presidency, and gave the Republican Party control of the majority of state governorships and state legislators. Great job Obama, no wonder many Democrat politicians running for office in 2018 don’t want you to campaign for them. But we have seen absolutely nothing in the last few weeks about McCain’s blemished record on immigration and the danger he had no problem putting our country in. Thank God none of the flawed immigration bills he favored were actually made into law. None of that has been commented on. Well at least they have now. But let’s go on to John McCain’s more contemporary actions. Then the artillery barrages really started. Donald Trump held a campaign rally in Phoenix Arizona. At that rally President Trump decried the lax state of immigration enforcement in the U.S. He brought to national attention the stories of families killed by illegal aliens. The rally cheered and cheered. Not a speech John McCain would have made. Those people Senator McCain angrily called “Crazies” were his own constituents. They cheered Donald Trump because Arizona is a border state and Trumps “secure the border” demands were the exact opposite of what they had received from John McCain for years. When you take a punch at Donald Trump, you are going to get one back. I think everyone knows that by now. Trump responded to McCain’s comments about his Phoenix rally with, “He’s not a war hero, he was a war hero because he was captured.” “I like people who weren’t captured.” Maybe not the cleverest of comments, but don’t forget McCain and Trump had been exchanging comments for several months and many of their comments were not, what shall I say, charming? Two weeks after Donald Trump was elected president and the treacherous “Collusion” lie was in full charge, Senator McCain, a Republican Senator, committed a reprehensible act, an act that demonstrated his priorities were not what was good for his party and country, but only to satisfy his innate desire for a spiteful revenge against President Trump. At that time Senator McCain attended a Canadian Security Conference along with one of his staff, David J. Kramer. British court records state John McCain ordered Kramer to England to get a personal briefing from Christopher Steel. That’s right the same Christopher Steel that hated Donald Trump and did every illegal and disgraceful deed he could to stop Trump from becoming president. After his covert meeting with Steel, Kramer then would return to Washington D.C. where Fusion GPS would provide McCain with hard copies; hard copies of what? Well that would be the infamous “Dossier” Hillary Clinton and the DNC paid Steel to manufacture and fill with false Russian information on Donald Trump. The false and treacherous dossier that the Democrats, their media, the FBI and the DOJ would use to illegally start Robert Muller’s “Democrat Inquisition” to unseat a lawfully elected American President. Why did John McCain so badly want this information? Why did a Republican Senator not check out that dossier for accuracy? McCain didn’t give a damm about accuracy he wanted to get his grubby hands on it to turn it over to the FBI ASAP. McCain was salivating with the expectation that the dossier information would cause the end of the Trump presidency. Too bad John, the FBI had had the dossier for months. As we now know the FBI had worked with and paid Steel for his cooperation with the bureau, then fired Steel for providing media with that information; of course we also now know the FBI was continued to stealthily work with Steel through back channels with the DOJ, unbelievable corruption. John you were a day late and a dollar short with your infamy. At Senator John McCain’s funeral the insult just kept coming. Not only did the Senator and his family insult the President of United States by telling the world he is not welcome to attend McCain’s funeral, but they also give the finger to the women McCain chose to be his Vice Presidential running mate as well, Sara Palin by letting the world she was not welcome either. Talk about nasty and vicious attitudes, the McCain family seems to be well equipped. Of course they welcomed Barrack Obama to attend the funeral, go figure. Just reinforces the truth conservatives now understand, “Establishment Politicians” regardless of party stick together against anyone or anything that threatens their control of the SWAMP.